For other people named Lonnie Smith, see Lonnie Smith (disambiguation). Lonnie Smith (born December 22, 1955) is a former Major League Baseball left fielder. He made his debut for the Philadelphia Phillies on September 2, 1978 and later played for the St. Louis Cardinals, Kansas City Royals, Atlanta Braves, Pittsburgh Pirates, and Baltimore Orioles. He overcame bouts with drug abuse to become one of the top base-stealers in baseball during the 1980s, with the seventh-most steals. He played on five pennant-winning teams, three of which won the World Series. Smith was traded to the St. Louis Cardinals in November 1981, for Lary Sorensen, in a deal which eventually netted the Phillies Bo Díaz. Smith continued to hit well in 1982, and to have a good on-base percentage. In fact, 1982 was a high-water year for Smith in several different ways: Smith was in the MLB All-Star Game for the only time in his career in 1982. He had a batting average of .307, and on-base percentage of .381. He led the National League with 120 runs scored, which was the only time that he scored 100+ runs in a season during his baseball career. Smith also set career highs in 1982 with 592 at-bats, 182 hits, 35 doubles, and 257 total bases during the regular season. He also ranked second in the National league with a career-high 68 stolen bases on the basepaths, but he was also caught stealing a career-high 26 times, since the Cardinals' manager, Whitey Herzog, had ordered his fastest players to attempt to steal bases whenever possible as part of his strategy for winning. All of the above pushed Smith all the way up to second place in voting for the regular-season National League Most Valuable Player for 1982. That season, outfielder Dale Murphy of the Atlanta Braves won the National League MVP award, tying for the lead in runs batted in and walloping 36 home runs. Smith batted a healthy .321 during the 1982 World Series, and he helped the Cardinals to defeat the Milwaukee Brewers ("Harvey's Wallbangers"), four games to three. Smith continued to play well during 1983, batting .321 (which placed him second in the National League only to Bill Madlock's .323), but in just 130 games, to again draw some MVP votes. However, this baseball season was struck with his first bout with illicit drug abuse, which sidelined him for a month at mid-season during a highly publicized rehabilitation stint at the Hyland Center in St. Louis. 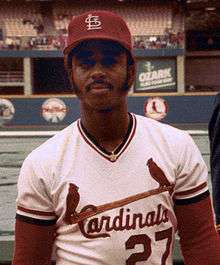 Smith returned to the Cardinals after his time on the bench in 1983, and he remained with them through the end of the 1984 baseball season. Smith went on to have his best season in three years in 1986, but saw his playing time reduced during the 1987 season. In July 1987, Smith told the Kansas City Times that under his agreement with the commissioner of baseball, he was supposed to be tested six to eight times per-year but had not been tested so far during 1987. More so, he strongly disagreed with Commissioner Ueberroth that professional baseball was free from illicit drugs. Following the 1987 season, Smith had trouble finding a new team to play with, and he came to think that then-Royals general manager John Schuerholz had blackballed him from the other baseball teams because of involvement in the cocaine scandal two years earlier By his own account, Smith was depressed and also addicted to cocaine when he considered murdering Schuerholz, and even purchased a pistol for that purpose. Smith had second thoughts about committing such a serious crime, however, and he dropped the idea entirely. During March of 1988, then-Atlanta Braves general manager Bobby Cox (who would be succeeded by Schuerholz during Smith's time in Atlanta) offered Smith a contract to play there. During Spring training, he made it to the team's 25-man roster, but he batted just .237 in limited playing time that season. However, in 1989, he cracked the starting line-up for the Braves' outfield, and he went on to accomplish one of his best baseball seasons, ever. During that season, Smith had a batting average of .315, and also had a career-high total of 21 home runs. Smith also led the National League with a .415 on-base percentage. Smith finished 11th in the voting of N.L. Most Valuable Player, and he was awarded the MLB Comeback Player of the Year Award. Smith continued to be a regular outfielder for the Braves during the next two baseball seasons, batting .305 in 1990 and .275 in 1991. Smith's play in 1991 helped the Braves move from last place in the National League West in 1990 up to winning the National League pennant 1991, and playing in the World Series for the first time since 1958, back when the Braves had Milwaukee, Wisconsin as their home city. Smith committed a baserunning blunder very late in the seventh game of the 1991 World Series, playing against the Minnesota Twins. Smith was on first base with no men out in the eighth inning of this scoreless (0 – 0) game. Then, the Braves' batter Terry Pendleton struck a line-drive double to left field. It appeared that Smith should have been able to score on this hit, but as he was rounding second base, he paused, and he then had to stop at third base. Smith later stated that he had lost sight of the baseball against the ceiling of the Minnesota Metrodome stadium, though replays from the TV coverage of the game showed that the Twins' second baseman Chuck Knoblauch and shortstop Greg Gagne had potentially deceived Smith; Knoblauch pretended to throw to Gagne for a force, but didn't actually have the ball. Regardless of the cause, Smith advanced just to third base. After a groundout (the runners could not advance) and an intentional walk (which loaded the bases), Smith was forced out at home plate in a double play, leaving the Braves scoreless. The score remained 0 – 0 through the end of the ninth inning. The Twins went on to score one run in the bottom of the tenth inning, hence winning the game 1-0 and winning the World Series four games to three. Next, Smith departed from the Braves, and he signed up with the Pittsburgh Pirates, where he played one season, and then one more with the Baltimore Orioles, where he played mostly as just a pinch-hitter. Smith played in his final Major League Baseball game on August 10, 1994. After retiring from pro baseball, Smith married once more, and he and his wife returned to Atlanta to reside. They became the parents of three children. Smith very briefly re-entered national attention in 2006, when he told a newspaper from Columbia, South Carolina, about his notion to murder Schuerholz eighteen years earlier. Smith is the only player to be a member of three different World Series winning teams (the Phillies, Cardinals, and Royals) within a single decade, and he did this in a six-year period. Smith set the franchise record for the St. Louis Cardinals on September 4, 1982, when he stole five bases in a single game. Smith won the National League's runs-scored championship in 1982, when he scored 120 runs for the St. Louis Cardinals. In that baseball season, he led the Cardinals to the National League pennant and also a World Series championship. This was also his only baseball season in which he was selected to play on the National League All-Star Team. ↑ "Lonnie Smith to Card, Diaz to Phils in 3-team deal". Gettysburg Times. Nov 20, 1981. p. 6C. ↑ Falkner, David (20 July 1989). "The Comeback Of Lonnie Smith". The New York Times. Retrieved 23 January 2010. ↑ Bock, Hal (23 March 1984). "Lonnie Smith recalls nightmare of drugs" Associated Press (via The Southeast Missourian). ↑ "Smith blast puts holes in baseball's alleged anti-drug abuse campaign". Kansas City Times. ↑ "Smith blast puts holes in baseball's alleged anti-drug abuse campaign". Lewiston (Maine) Daily Sun. 1987-07-29. Retrieved 2009-01-05. ↑ as indicated by ABC News. ↑ Bill James, The 1986 Bill James Baseball Abstract, page 279.